This home renovation is adorned with beautiful, curving accessories dripping in jewels. The theme included all the feminine swirls and curves we could tastefully incorporate into one residence. To begin, we paired masculine influences of dark woods, a massive stone fireplace and stove hood, and Indian Black Granite accents. 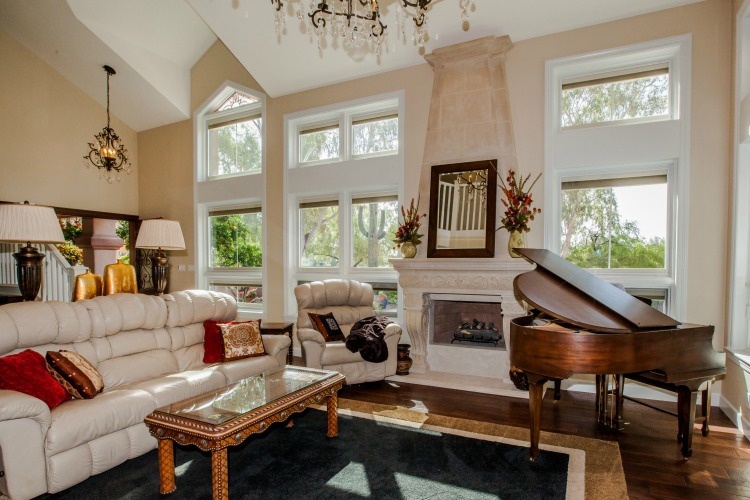 The combination of which created a home fit for its owners’ and its upscale surroundings. As a result of our homeowners confidence in our design and knowledge, their award winning home has been featured in Su Casa Magazine. 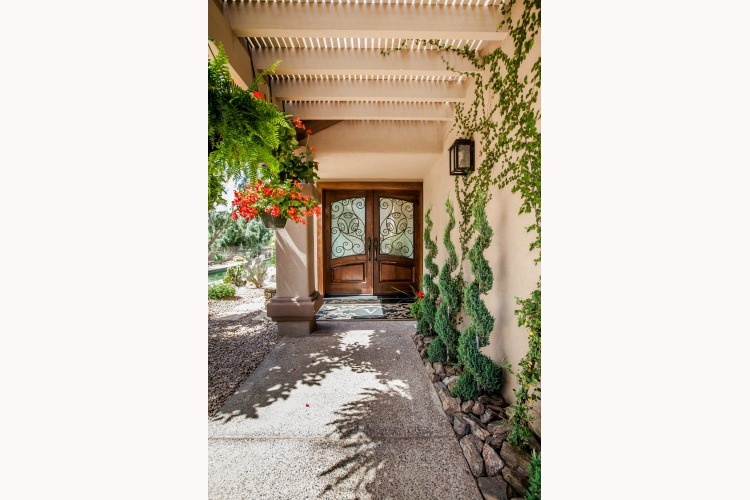 Tri-Lite Builders can also be your Paradise Valley AZ Upscale Remodeling Contractor. From the front gate, this home now tells the story of its family. 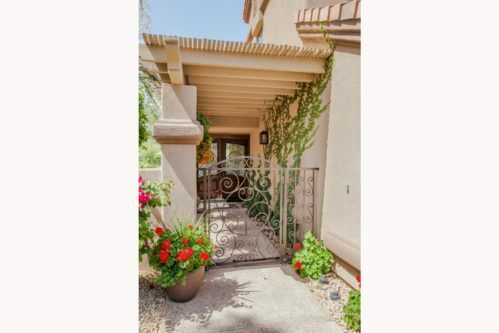 The custom iron gate resembles the iron details at the front door with it’s subtle initial creatively centered to be a focal point of this one-of-a-kind design. 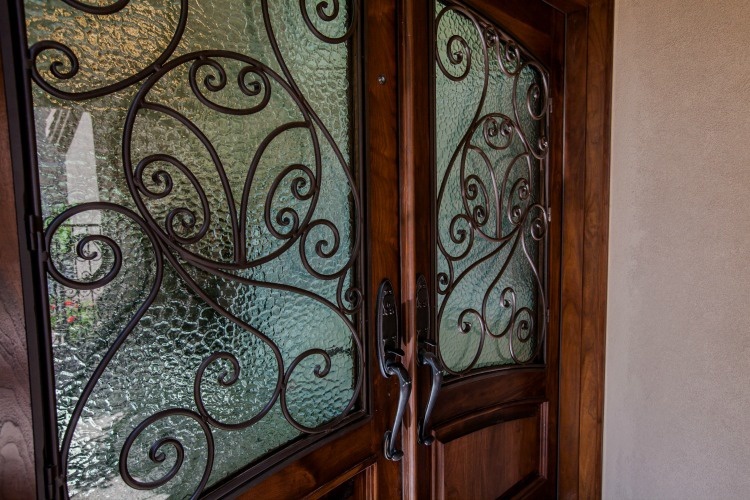 The beautiful carved wood doors invite one to explore the beauty that hides behind. 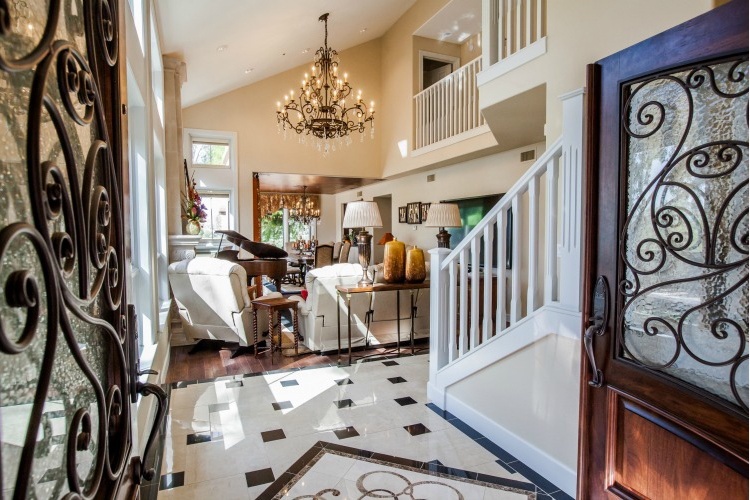 Upon entry, the beautiful medallion only draws you in as you catch a glimpse of the stunning focal point chandelier. 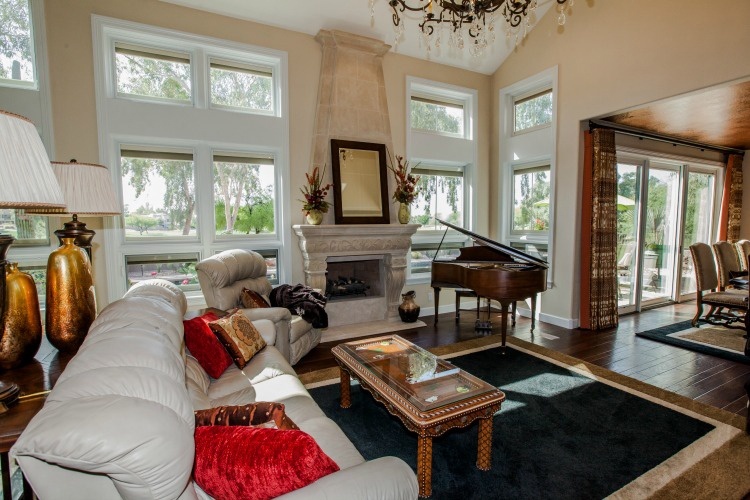 Then the massive carved stone fireplace mantel and over-mantel hint at the castle this home has become. 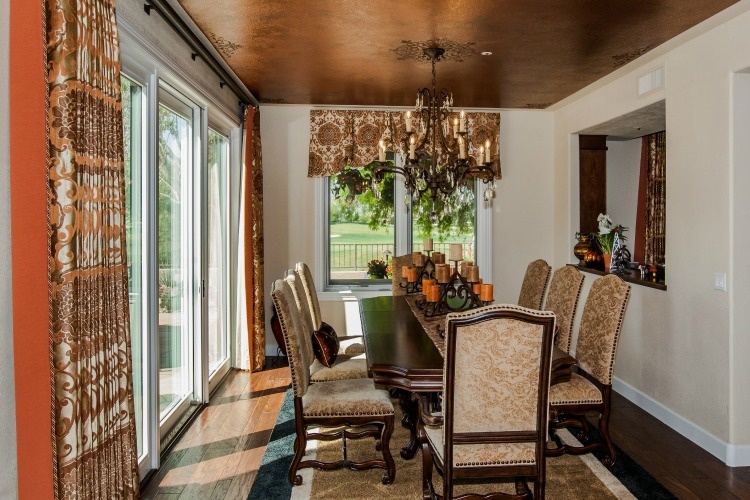 With no surface left untouched, our remodel makeover of this impressive home leaves you peering around each corner, only to have your breath taken away yet again. Now graciously appointed, the kitchen that started the whole thing. We made sure to add under-cabinet, in-cabinet and toe kick LED tape lighting to provide the ambient glow for entertaining. The island is large enough to entertain, prepare and serve family and friends combined with storage and function abounding. Interior storage accessories make for a well organized space. 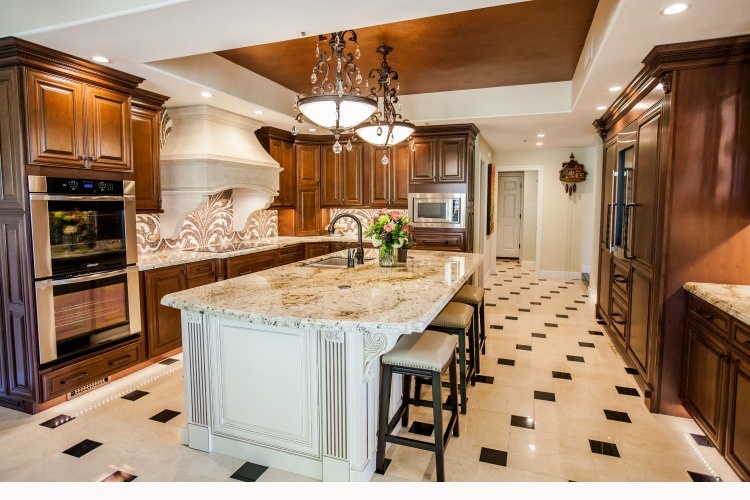 The focal point is the stunning: Emperado Dark, Crema Marfil, and Rojo Alacante marble hand made mosaic backsplash. All things considered, this new kitchen befits its surroundings. After all is done, even the homeowners can hardly imagine that this is the same home they lived in seven short months ago. A diamond in the rough is now complete. 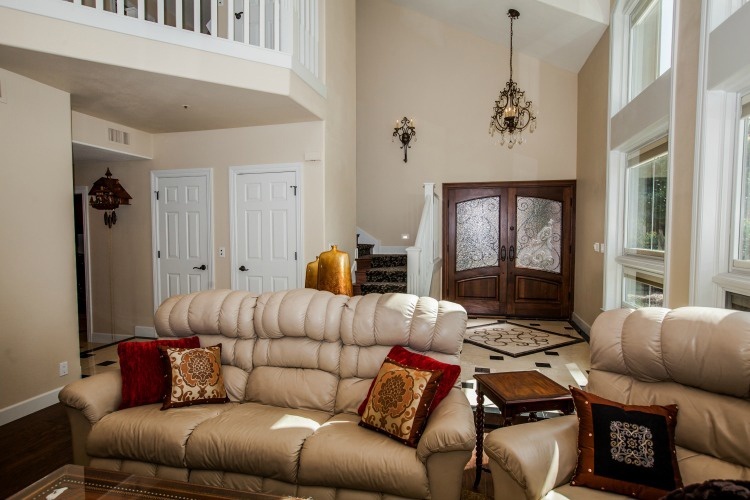 Therefore, consider making Tri-Lite Builders your Paradise Valley AZ Upscale Remodeling Contractor.